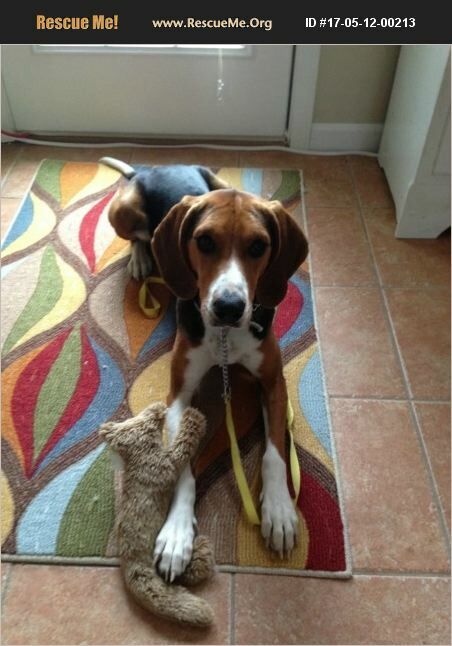 Arkansas Treeing Walker Coonhound Rescue View other Treeing Walker Coonhounds for adoption. This is Phoebe and we would like to find her a home with a person or family that has more room and energy than we do. We acquired her from a neighbor last February after she was found running around the neighborhood baying and treeing cats. The vet thinks she is a purebred Treeing Walker Coonhound and she is up to date on all her shots and medications. She is crate trained and walks well in a halter. We have 5 inside cats and they have worked out a pretty good co-existance, but once outside she's in hunting mode and will not return when off the leash. She gets along with other dogs at the dog-park, but prefers to sniff the fence than to instigate a game. Phoebe likes to curl up in a chair, bed or couch to be loved on, and will disappear under the bed or in a corner of a closet if there is a hint of a thunder-storm coming. She eats well, but is an opportunist when it comes to counter-surfing - it's a nose-hound thing. She gets along well with us and other people, but doesn't seem to understand retrieving a ball or playing tug with a rope. She does love (to death) her soft toys, but has been known to nibble on a couch cushion. She seems good with school-age children, and has not been aggressive with anyone to our knowledge. We would very much like to see Phoebe go to a home with wide open spaces or a large fenced yard where she can run and sniff to her heart's content. Phoebe is soft and loving and re-homing her has been a very hard decision, but we truly think she'd be happier with a family that has more space and a more active lifestyle than we can provide her.